I left my room to go talk to my mom and left my little brothers food on the table. When I came back Lola, my dog, was eating the food so I spanked her, then out of frustration I kicked her in the middle of her back and she yelped. She then ran away with her back feet not being normal they were skittering outwards like a frog. I kicked her because she's done this at least 5 times leaving him hungry. She's been my dog since '07 and I love her and now I'm scared she paralyzed. Please help me. What's wrong with her? Will she die? And I don't have enough money for the vet. What should I look for/feel for on her back? Your only option at this point is to make sure she is taken to a vet. There has been some damage done, the real question is how much. Not taking her to see a vet would be a bad decision. I know you said you don't have the money, but sometimes it's possible to work out repayment plans to pay for visits. There is also pet owner's insurance that you can get that would pay for emergencies such as this. From a purely monetary standpoint, saving money by not taking her to a vet is a short term investment, and it only works if the expenses that occur from that investment are less than what is saved. I think you'll find that with the time and money you will spend afterwards, you would have saved more in the long run by making a long-term investment and taking her to the vet immediately. Even spinal injuries that have been treated can have complications in the future. Untreated spinal injuries can come with those and more. Being paralyzed is one, inability to control bowels is another. With the nervous system running through the spine it's actually a huge risk for neurological conditions to develop from the damage. Even if the damage is minimal, and there is a possibility that it will heal on it's own, there's no telling what the lasting effects will be. Think about it this way, when people break a bone they don't go to the doctor because it won't heal on it's own, but because it will heal incorrectly. Bones are not meant to be moved out of place, and once out of place they will not move back on their own. 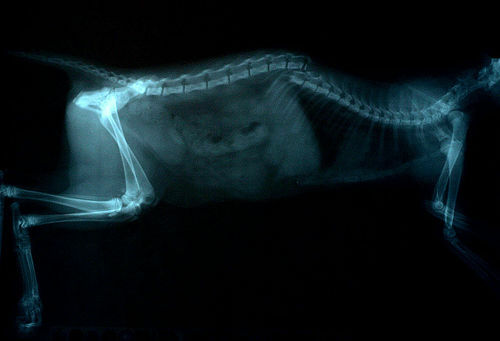 This is an x-ray of a cat with a broken spine. If you ran your hand along the back you would probably feel the bump where the spine is misplaced (along with noticing the animal scream in pain no doubt). Even a single slipped disc is enough to pinch a nerve and cause constant pain. From an ethical standpoint, you can not choose to let your dog live the rest of her life in pain for the sake of monetary gain. This is not because you're a bad owner but because it is what she needs, if you can not afford to have her injuries cared for by a professional you should consider giving her up to a foster home or shelter where someone with the financial ability can. She can not take care of herself and it is your responsibility to make sure she is cared for. Finally, never attempt to treat any injuries such as this. Attempting to fix this could pinch a nerve, or even internal organs (punctured organs can result in death). Even taking her to the vet you will want to be extremely careful. Don't pick her up if you can help it as that will bend the spine. Try to have her walk into the car if she can still move. Place a ramp so she doesn't have to jump in or out. Otherwise, lay her down on a board, or in a carrier, to act as a stretcher. Be aware that what you have done may already constitute animal cruelty, a criminal offense in most jurisdictions. The good news for you is that vets will typically (though not everywhere) have an obligation of confidentiality towards a client, but this can be breached if the vet suspects sufficiently serious or ongoing abuse. Failing to seek appropriate care promptly will likely impact on a vet's decision whether or not to report the matter further. If you are worried about getting into trouble, you are less likely to face action if you act fast, now, to get the animal appropriate care. If you have to take your dog to the vet as an emergency admission later then the likelihood of them making a report will increase significantly. (1) A person commits an offence if— . In this case a dog would be considered a "protected animal" as defined in the legislation. Very similar laws exist in other countries, so don't just shrug this off if you don't live in the UK. Understand that what you have done is very serious and can never happen again. Ultimately, your first priority now should be that your dog, which you claim to love, gets the best possible care. GO TO A VET. Not the answer you're looking for? Browse other questions tagged dogs injury or ask your own question. Why won't my dog eat on her own? How can I teach my dog to walk on slippery floors? My dog isn't peeing or pooping and is walking funny.. What is this?